Portions of this post originally appeared on my family blog here. A few weeks ago I posted about the rainbow birthday cake I made for Boo's fifth birthday. Well, here is how I set the rest of the party up. 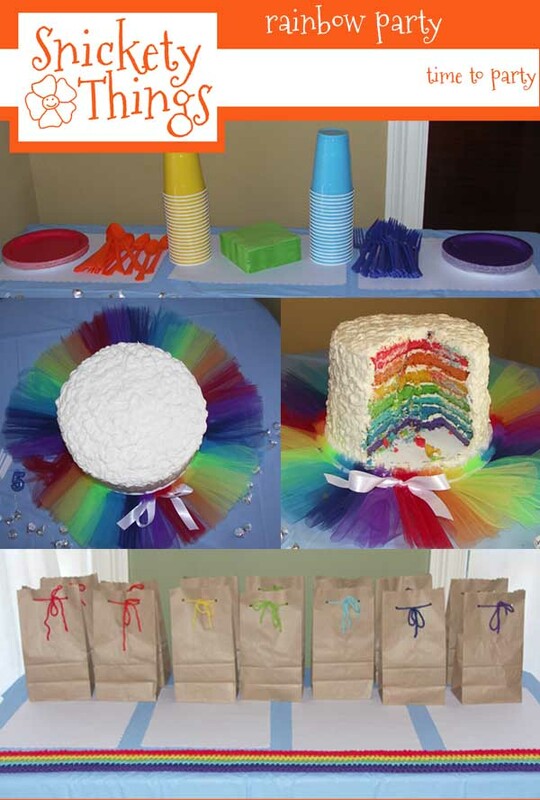 It wasn't a big party so I didn't go overboard with the decor, just enough to hint at the rainbow theme. It also didn't help that her birthday falls just after the Christmas holidays and the entire family passed around a tummy bug that pretty much knocked us out and kept me from getting any real shopping done. Thankfully, with the help of Pinterest, I discovered a very easy way to find inspiration that would have taken me much longer than just searching the internet. Now, Boo knows what colors are in a rainbow and that they total seven, not six. I had to be careful in picking things so it would have all of the correct colors. For the items I couldn't, I explained it really was the best I could do and she seemed to except it. Mostly. After some grumbling. Lets start with the cake. I found inspiration on Marthastewart.com. I knew this would be the perfect cake. 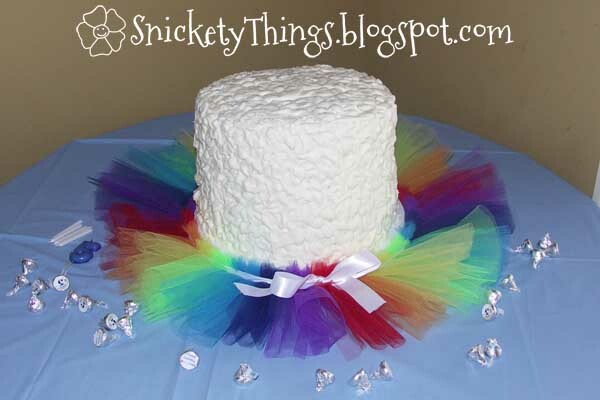 I had also seen a tutu cake stand on Pinterest. 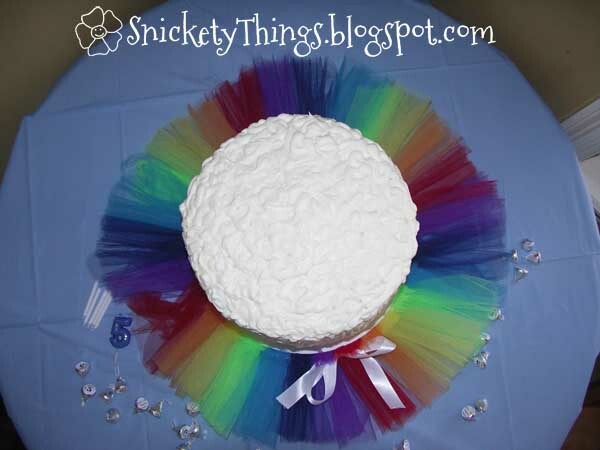 The complete instructions to make this cake is in the rainbow cake post and the the rainbow tutu is in the rainbow tutu post, so I won't go over it again here. Here is how they looked. Notice the tablecloth? It is supposed to mimic the sky. 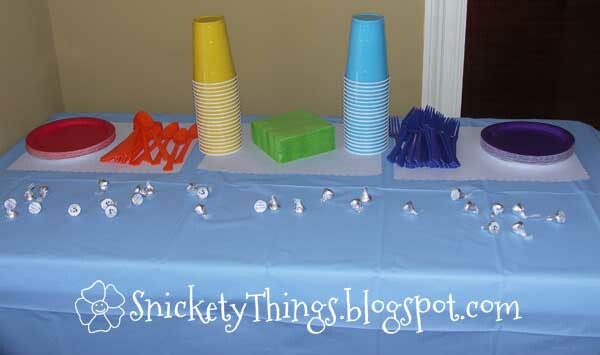 I bought some white placemats to be clouds and bought cups, plates and utensils in all the rainbow colors. My husband believes that I have OCD and bought these things to be in this particular order on purpose. Nope, my OCD had me buy them like this completely without my knowledge. I didn't even realize I had done it until I set them out. See those Hershey Kisses? Have a closer look. Aren't they cute? They match the invitations I made for her. I just made small images, printed them on to sticker paper and punched them out with a 3/4 inch round punch. 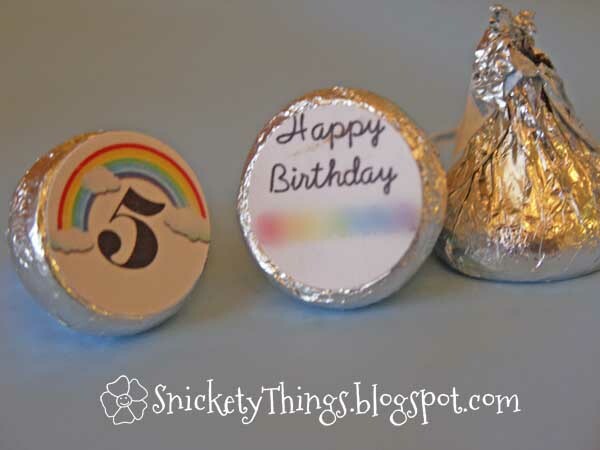 These turned out to be a big hit and I have a lot of requests to make some for their occasions. I also made some sky to go along with the cake. I found the inspiration here. I did not follow the directions posted in my source above. I made up six batches of blue jello and let it set in the refrigerator. After it was set, I stirred it up to break it into small pieces. 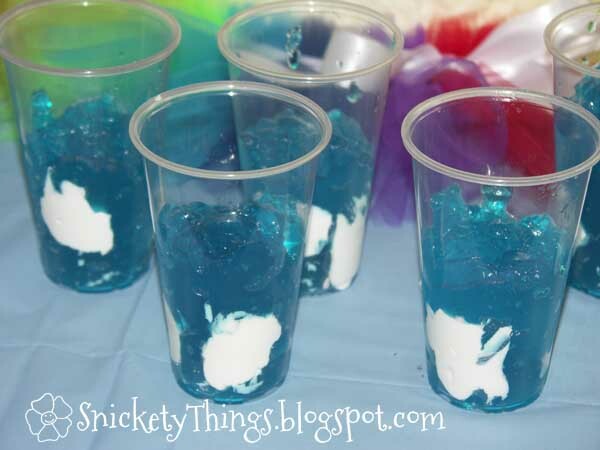 My husband piped Cool Whip onto the sides of the cups and I just spooned the jello in. Very easy. For the piping, I just used a disposable piping bag, but I am sure a baggie would work just as well. The thank you bags were also very simple to make. I just used brown lunch bags (I couldn't find my stash of white, bad organization skills) and cut the tops with craft scissors to give a cloud-like appearance. I then used yarn I had leftover from making Boo a rainbow scarf (see it there in the picture) to tie each bag in holes I punched with a standard hole punch. See the rainbow at the front of the table? It is a rainbow scarf I made for her. The pattern can be found here. I wish you could see the ends in this picture, there are little clouds on the ends. 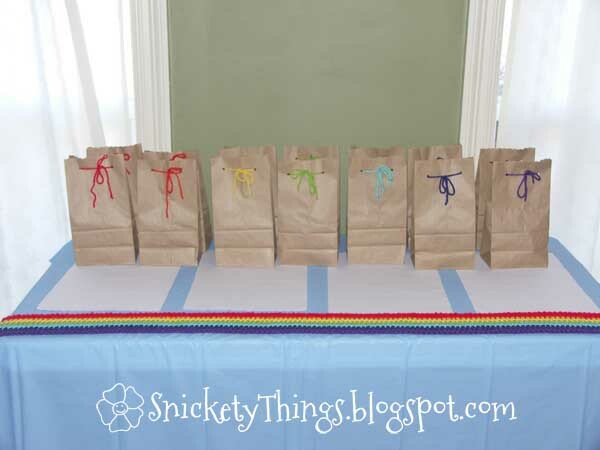 These bags were stored under the table until the end of the party and this table was used for gifts. Again I used the placemats to look like clouds. 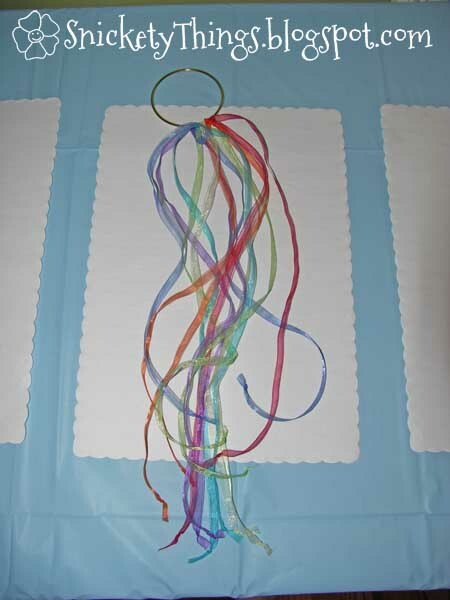 The craft I had the kids do during the party was ring with the ribbons hanging from it I saw here. I chose not to get bells, and I had a hard time trying to find the same type ribbon in each color. Finally I found a sheer ribbon at Hobby Lobby in all the right colors. This is the example I made for the kids to see. I wish I could have found a wider ribbon to fill the ring a bit more. I had already bought those rings at an earlier date from Hobby Lobby. 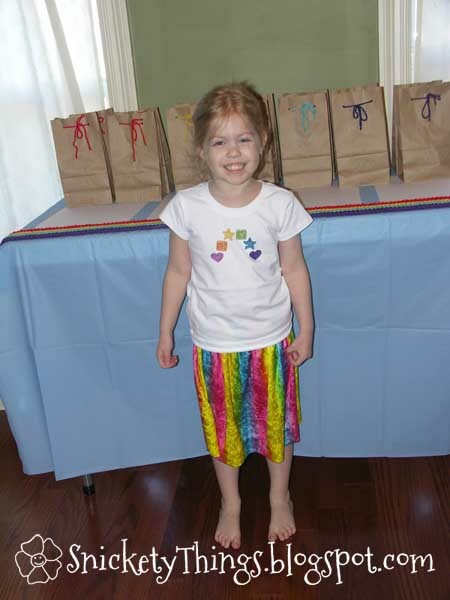 Boo wanted a rainbow skirt to wear during the party. I found this fabric at Hancock and with the help of a friend, made a simple little skirt. The t-shirt came from Walmart and I sewed on the buttons tat I had found at Hobby Lobby. It turned out cute. Doesn't she look happy? I will spare you the rest of the party photos. Oh wait! Did you see the cake as it was cut? Maybe just two more shots then. Here is Boo blowing out her candles with Daddy's help. And here is the cut cake! 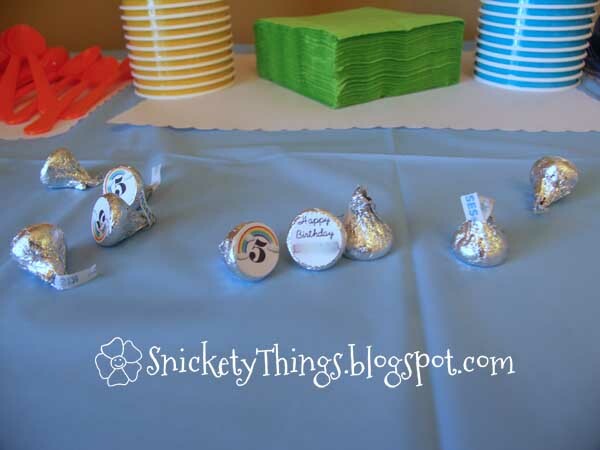 What a fun party for a five year old! Love the rainbow theme. I remember the cake from a previous post. WOW! What an awesome job...I hope your girls know how blessed they are! 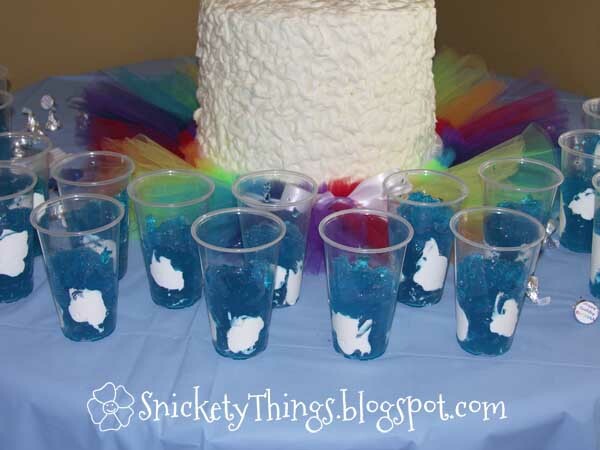 Fun ideas-- oh so bright! Thanks for linking up at Beyond the Picket Fence! Thanks Jodi! I always love looking at all the different ideas, too. Thank you! She had a lot of fun. You did an amazing job. loving the rainbow theme. FUN! 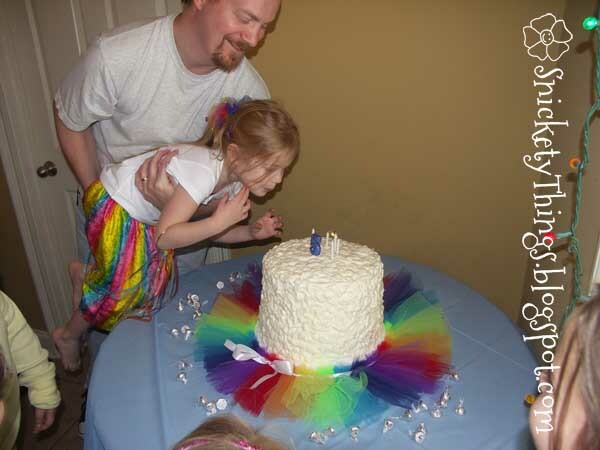 I love the rainbow tutu on the cake. How darling! Your cake is AMAZING and looks really tasty! Thanks! I am all about easy, and I would rather spend the extra money on gifts for them or saving for family vacations. Such a fun theme! 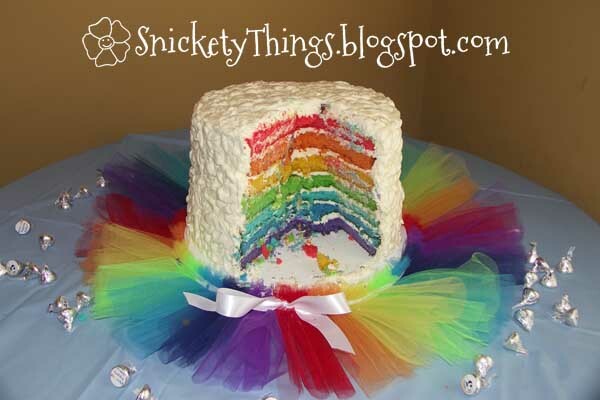 Love the rainbow cake most of all! Thanks for sharing at Shine on Fridays! I will have to check out your rainbows! So cute! I love the cake and the set up of the table as the sky with clouds is fabulous. It's hysterical that you bought everything to lay out as a rainbow without knowing it. The hershey kisses were a great touch. I'm pinning the party. Thanks so much for sharing at Whimsy Wednesdays. Thanks Jenny! And thanks for pinning! Thanks! Let me know how yours goes when you finally throw it!